Our swimming pool is large enough for the family to have a playful dip or to swim a few laps. There is also a toddlers area for the little ones. 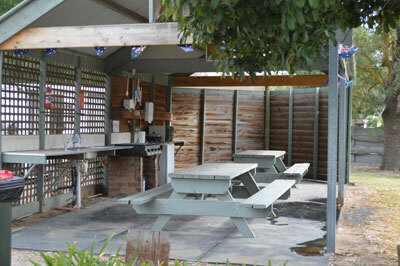 We provide easy access drivethrough sites for the tired traveller only stopping one or two nights. Small, medium and large motorhomes can be catered for. A free gas BBQ is provided, undercover, for your enjoyment. We stock milk, drinks, ice creams, a small supply of grocery items and we can refill your gas bottle. FREE WiFi is available throughout our park, so don't forget the laptops! A 400 metre stroll takes you to the Goulburn River where there are popular walking tracks and fishing spots. 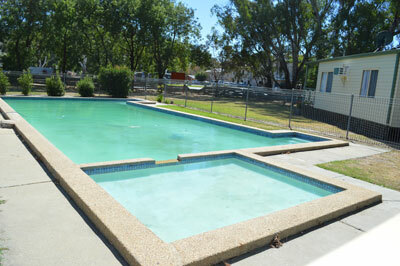 Pets are welcome at Highlands caravan park on site bookings (excluding Easter and all long weekends). Must be on lead at all times whilst in the park. Sorry no pets allowed on Cabin Bookings.